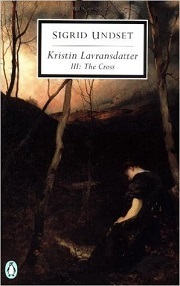 The final book in Sigrid Undset’s Kristin Lavransdatter trilogy (translated by Tiina Nunnally) finds Kristin, Erland, and their sons back at Kristin’s childhood home of Jørundgård, thanks to Erland’s political machinations detailed in The Wife. They no longer have the wealth and influence they were accustomed to, but they are able, for a time at least, to maintain a close relationship with Kristin’s sister Ramborg and her husband Simon. But Simon’s history with Kristin creates emotional complications all around. Over time, the complications and hardship bring tension into Kristin and Erland’s marriage. And, as Kristin’s sons grow up, she worries that they will, like her, choose paths that they later regret. Her feelings about her marriage remain conflicted. She loves Erland, but she can’t get past her own guilt about the beginnings of their marriage, and Erland’s lack of guilt doesn’t help. This book got me thinking a lot about the interaction of guilt, grace, and faith. After her marriage, Kristin did penance and sought forgiveness for her early relationship with Erland. But years later, she can’t let it go. It would be easy enough to say that there’s a sort of religious mania at work here — that she’s been taught that her purity is her only worth and now she’s forever tainted. And certainly there’s a burden laid on Kristin that Erland never suffers. But, to some degree, I think Kristin’s guilt is of her own making. She did her penance. Her parents and her priest got over it. That’s not to say there were no consequences for her breaking her promise to Simon and her parents. She’s still a sometime subject of gossip, and Simon’s feelings cause issues in both of their marriages. But I get the sense that she’s never accepted God’s grace for herself, and so she remains stuck in that mistake. Later, she encounters a woman who goes through something of the same journey she went through, and that woman is able to get over it without getting mired in guilt. And maybe, just maybe, her approach is healthier in the long run, even if it is less honorable. The book seems to recognize the merits of both approaches, although its heart is with Kristin. And all of that is what makes this trilogy so rich. It delves into the social morays of medieval Norway, but it’s mostly focused on people dealing with their feelings. Those feelings are informed by the time, but guilt and worry and destructive thought spirals are of all times. As are questions of how our actions affect others and how to balance our own desires with our beliefs about right and wrong. The book concludes with an amazing sequence in which Kristin goes on a sort of pilgrimage that is even more arduous that the one she took in The Wreath. This time, she finally seems able to put her burdens down. The ending is happy, in a way, but it’s also tragic. Kristin was a remarkable woman, but she let herself in for so much unnecessary suffering. It was difficult to watch. You made good time with this trilogy! It sounds as if it got more deeply engaging as you went along. Your discussion of its treatment of “the interaction of guilt, grace, and faith” make it sound as it if is morally serious in an interesting way. The emotions definitely get more complicated as it goes. And Undset’s Catholicism brings with it a moral seriousness that she allows to be complex, rather than settling for simplistic ideas. I read the excellent one-volume version (Tiina Nunnally) about ten years ago. I thought it was one of the richest works of historical fiction I had ever read. Your thoughtful review has made me want to put it high on the TBR shelf. As I learned recently when I reread “East of Eden,” the time in your life when you read a book has a dramatic impact on its effect on you. I suspect that now that I’m even older Kristin’s story will be even richer. I suspect this will stand up well to rereading. Knowing in advance where Kristin will end up would make the journey so much richer.